New York, NY (August 11, 2016)--Groundbreaking and ahead of its time, Pet Sounds -- the 11th album by The Beach Boys -- was a pioneering feat in production, sound, and songwriting...a work that continues to inspire musicians and fans to this day. On September 23, 2016, Eagle Rock Entertainment will give fans a behind-the-scenes look at its creation with the release of Classic Albums – Pet Sounds, the latest addition to the acclaimed & award-winning Classic Albums series. Released on DVD and Blu-ray, [MSRP $21.98 Blu-ray, $15.98 DVD] this film tells the story behind the making of Pet Sounds, which celebrates its 50th anniversary this year. 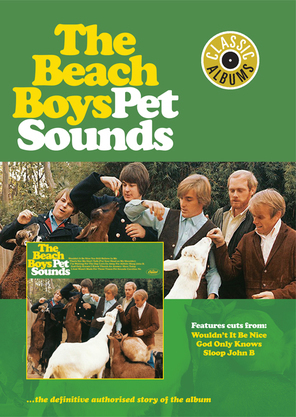 Pet Sounds was recorded in late 1965 and early 1966 about a year after Brian Wilson had withdrawn from playing live with The Beach Boys in order to concentrate on composing and studio work. While the rest of the band were out on tour, Brian Wilson worked in the studio creating multi-layered compositions with painstaking attention to detail utilizing orchestration, sound effects and unusual instruments. When the band returned from tour, they went into the studio to add their trademark complex vocal harmonies. The new direction of the music caused some consternation within the group. The program explores the band’s relationship at this time as well as the creation of the music through interviews with all the surviving Beach Boys and others involved in the creation of the album. The US press didn’t know what to make of the album at first, although it later became acknowledged as both important and influential. Contrarily, the album was immediately acclaimed and commercially successful in the UK, peaking at No.2 in the albums chart and remaining in the Top 10 for 6 months. Pet Sounds is now universally regarded as one of the finest albums of the sixties and thoroughly merits its place in the Classic Albums series. Eagle Rock Entertainment is the world’s largest producer and distributor of music programming for TV, DVD, Blu-Ray and Digital Media. Eagle produces quality HD programs, both concerts and documentaries, directly alongside artists including Imagine Dragons, Paul McCartney, Katy Perry, The Rolling Stones, Pink Floyd, The Who, Queen, and Peter Gabriel. Eagle is a multiple Grammy® Award winner and has received numerous multi-platinum sales awards around the world. Eagle Vision is headquartered in London, and is a Universal Music Group company.